I stopped a few moments at Portland Cocktail Week to check out the Lost Art of the Technical Free Pouring with industry veteran Tobin Ellis. 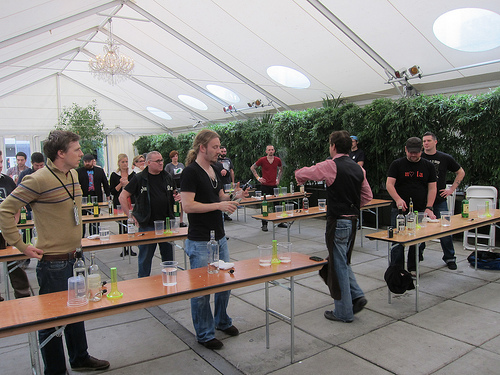 Billed as a seminar no bartender or bar owner should miss, it was to teach pouring mechanics that would lead to making cocktails twice as fast with twice the profitability. With enough practice, free pouring comes within 1/8 of an ounce every time or so claimed Tobin. Here are a couple of vids. This video showed how to pour with less spilling. Tobin also demonstrated classic cuts such as this one he named the Faucet cut. He asked the bartenders to “follow through” with the pour which smoothly stops the pour so you don’t spill. It’s like turning off the faucet. I thought his seminar was very interesting considering how I’ve gotten so many bad, unbalanced drinks leading to my love of jiggering and measured pours. But then I think about all the times I’m impatient for a drink and I’m sure the bartender is also impatient to bang out a ton of drinks without affecting the taste of the cocktails. This leads to learning how to free pour with accuracy. I know there’s counting involved (and truth be told, I free pour when I make my own drinks). This article is great. I have always known that an ounce is about a 4-count. You can then go from there and think about how it’s about a second for every 1/4 ounce. By this reasoning, it’d be 2-count for 1/2 oz, 4-count for 1 oz and 6-count for 1.5 oz. I’ve now watched enough cocktail competitions to appreciate when free pouring has its place. If you’re going for speed, free pouring is the way to go. You just have to practice, practice and practice some more to be accurate. This entry was posted in bar stories, bars, cocktail competition, cocktail week, cocktails, events, hot bartenders, the minty, travel and tagged bar magic, barmagic, free pour, free pouring, jiggering, jiggers, measured pours, measuring, pdx, portland, portland cocktail week, seminar, tobin ellis. Bookmark the permalink.